Blog about the Atlanta GA high-rise condominium and loft market. There are currently 49 blog entries related to this category. Tuesday, April 16th, 2019 at 1:37pm. The amenity rich lifestyle that accompanies High-rise living can be all encompassing. However, one thing that can be difficult to incorporate to condo living is green space. Living near a park isn't just good for our furry friends, having a one nearby is good for people too. If having a park within a block or two of your home is important to you, check out these Atlanta condo buildings. Friday, November 9th, 2018 at 10:04am. Friday, December 8th, 2017 at 11:42am. Live, work, and play at Atlantic Station - Atlanta's own "City within a City" with a walk score of 85. Located in the premier 12 Atlantic Residential Tower, this is the highest floor standard 2+2 available. Features include all new paint and lighting, an open and light filled layout offering en suite roommate stye bedrooms, separate dining/office flex space, built in work station, large expansive balcony, and panoramic 180 degree city, lake, & sunset views. There is also an storage room (approximately 10x8x12) that can convey for $10k extra. The building includes hotel quality amenities, 24 hour concierge, a strong HOA, and VA and conventional financing. Seller is considering all reasonable offers! Wednesday, August 23rd, 2017 at 11:32am. Sleek, contemporary, true Bauhaus loft in Midtown's premier boutique loft mid-rise! This is the first resale of this popular layout in 3 years. The floorpan offers an open yet defined space with rare, true Bauhaus aesthetic with exposed mechanicals, approximately 12 foot exposed concrete ceilings and columns, factory style bay windows, top of the line finishes, plus all new contemporary hardwood, poured concrete counters with a dining depth kitchen island, sleek custom lighting and blinds, and reconfigured closets to double the space. The unit has temperature controlled storage on the same floor, and dues include cable, internet, parking, and gas. Thursday, July 6th, 2017 at 9:00am. Live, work, & play in the East Andrews Retail District of "Buckhead Atlanta" with a walk score of 80! Rare, true loft with Bauhaus aesthetic including approximately 20 foot ceilings, exposed ductwork, exposed brick, glass block wall, & oversized factory style floor to ceiling palladium windows. 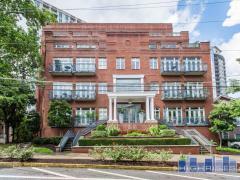 Open yet defined layout with gallery style entry foyer, oversized living area with separate dining, walk-in laundry/pantry, large balcony with city views, upgraded lighting, covered parking, and rare oversized storage (approximately 10x8x6). Amenities include pool, fitness center, community rooftop deck, and 24 hour concierge. Thursday, November 10th, 2016 at 1:31pm. This 1 bedroom condo is located at the inconic Metropolis building in the heart of Midtown Atlanta's most vibrant and popular live, work, and play neighborhood with a walk score of 93!! It is the only one of this North facing layout available with views not affected by new construction in the area. The open yet defined layout offers a gallery style entry foyer, built in office work space, as well as guest and private access to the master bathroom. The easy wall addition offers the option to create a separate bedroom without having to pay the extra $20-$30K that a 1 bedroom unit with similar sqaure footage in the area may sell for. The building offers a sleek, resort quality amenities level and 24 hour concierge. VA/FHA/Conventional financing allowed. Tuesday, November 1st, 2016 at 3:06pm. Live, work, and play at Atlantic Station - Atlanta's own "City within a City" with a walk score of 85! This 1 bedroom, 1 bathroom unit is located in the Premier 12 Atlantic Residential Tower. There is only 1 of this layout available with custom lighting, backsplashes, and finished ceilings. Enjoy jaw dropping 180 degree unobstructed Northern City views from a solid wall of glass, an open yet defined layout with entry foyer, built in office workspace, large living/dining/kitchen flex-space, two sided double entry walk in closet, and private access entry from Master Bath for guests. The building offers hotel quality amenities, VA, and Conventional financing. Tuesday, October 4th, 2016 at 1:59pm. Live, work, & play at Atlantic Station - Atlanta's own "City within a City" with a walk score of 85*. This is the only non ground floor exterior facing condo with this floor plan. Warm and inviting, it offers a stately entry foyer that leads to open, yet defined, oversized living/kitchen/dining concept with balcony access. En suite, oversized master bedroom with privacy foyer and access to covered balcony. Spa-like master bath with soaking tub & 3 sided walk-in closet. New flooring & paint. Lake, monument, & city views from balcony & interior. The building offers resort style amenities. FHA, VA, and conventional financing available. Wednesday, September 14th, 2016 at 3:11pm. Live, work, & play at Atlantic Station - Atlanta's own "City within a City" with a walk score of 85! Located in the premier 12 Atlantic Residential Tower, this is the only one of this corner layout available and the only corner 2+2 under $300,000. Enjoy jaw dropping 180 degree views from every room, a light filled open layout with gallery style entry foyer, large & open living/dining/kitchen flex space, en-suite split plan master suites, 2 walls of floor to ceiling glass, and oversized corner balcony. The unit can be sold fully furnished outside of sale. Twelve Atlantic Station offers hotel quality amenities. VA and Conventional financing available. Friday, September 2nd, 2016 at 11:46am. Located in the iconic Metropolis building in the heart of Midtown - Atlanta's most vibrant and popular live, work, and play neighborhood with a walk score of 93. Rare corner 1 bedroom and only one of this plan available. Sleek contemporary renovation including polished concrete floors, refinished cabinetry, and custom, bar height, marble countertops in kitchen and bathroom. The unit offers a gallery style entry foyer, enclosed bedroom, walk-in closet, and jaw dropping 180 degree unobstructable views from 3 walls of floor to ceiling glass. The building offers a sleek, resort style amenities level and 24 hour concierge. VA, FHA, and Conventional financing.